Without some powerful way to blast them high above the ground, firework displays could only be enjoyed by small groups, rather than the large crowds they entertain today. This video segment, adapted from NOVA, shows how pyrotechnicians load and fire these magnificent displays. This resource was adapted from NOVA: "Fireworks!" The primary chemical component in nearly all fireworks is "black powder." The recipe for black powder, a mixture of 75 percent saltpeter (potassium nitrate), 15 percent charcoal (carbon), and 10 percent sulfur, originated in China about 1,000 years ago with a slightly different proportion of ingredients. Black powder has been used in loud and fiery displays ever since -- first to ward off evil spirits, and later to entertain and celebrate. Today's fireworks rely on black powder for two critical functions. Gas released when the powder combusts first propels the firework skyward and later blasts its contents outward into the elaborate patterns that spectators come to see. 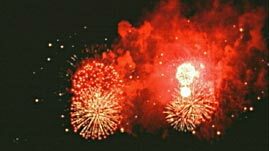 However, other chemical ingredients are also needed; without them fireworks would produce little more than yellowish-orange sparks and white smoke. 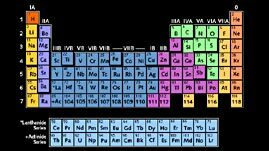 Due to differences in atomic structure, different atoms give off different wavelengths of light after being heated in a flame. Strontium chloride for example, burns with a red flame, while barium chloride produces a green flame. To produce multicolored displays, pyrotechnicians, the people who create fireworks, combine several different chemical ingredients into a single firework. The lifting charge, made of black powder, propels the firework skyward. As it travels higher and higher, a time-delay fuse burns. When the firework reaches its peak, the fuse ignites one or more charges that blast the firework's "stars" -- individual pieces made up of these various chemicals -- into the air to form the beautiful patterns that audiences love. In general, the components of a firework expand evenly when the firework explodes. 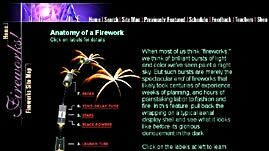 Therefore, the placement of stars inside a firework determines their arrangement when the explosion occurs. For example, a shell loaded with stars made of strontium chloride in the center and barium chloride around the perimeter will produce a flower-like display of red surrounded by green. By varying the type of chemical, as well as the size and configuration of stars, nearly infinite color and pattern combinations are possible. Trace the evolution of fireworks from their invention to today in this NOVA classroom activity. Who discovered gunpowder? What is the most important chemical compound in gunpowder? Why do you think potassium nitrate, charcoal, and sulfur become explosive after they are ground together? Describe what pyrotechnicians call "stars." Describe the design of a star-filled shell that results in a burst of color high in the sky. How are various firework shapes achieved? What designs might pyrotechnicians use? What series of events take place once a firework shell is ignited? How do pyrotechnicians control the timing so that the firework doesn't explode until it is 500 feet in the sky? Discover a variety of opportunities for exploring how scientific discovery and engineering lead to innovation. New software makes it possible for law enforcement to search through hours of surveillance footage in mere minutes. Producer Miles O'Brien is interviewed about state-of-the-art surveillance systems and what they portend for privacy. How multiple lines of defense, from massive barriers to oyster reefs, can protect our cities from storm surges. Explore a panoramic image of the control room at the Pilgrim Nuclear Power Station's training simulator. Explore what holds atoms together to form the myriad chemical substances found in our world. Think you know your stuff? Identify 10 mystery materials from a set of clues. See the materials and technologies that go into a smartphone as well as their environmental impact. Bacteria help us in all kinds of ways, from fermenting foods to aiding medicine, cleaning oil spills to mining minerals. 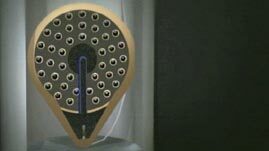 Using a new wireless charging system, plug-in electric cars may be able to shed their power cables entirely. Developing clean energy technologies makes sense not only environmentally but economically, Nobelist Steven Chu argues. Are workers at U.S. nuclear power plants prepared to deal with earthquakes, tsunamis, and other disasters? Nanomaterials are used in consumer goods from cell phones to sunscreen. But how safe are they? Hear from Greg Hall, the drilling expert whose team reached 33 Chilean miners trapped more than 2,000 feet underground.